This classic Chocolate Buttercream Frosting Recipe is the only chocolate buttercream recipe that you will ever need. It tastes amazing, pipes beautifully, and has been our go-to chocolate buttercream for years! You are going to LOVE how easy this chocolate frosting is to make. Throw that canned chocolate frosting in the trash, it won’t taste good to you anymore! What Cakes Taste Great with Chocolate Frosting? This Classic Chocolate Buttercream is silky smooth, has a fantastic chocolate flavor, and it is the perfect complement to SO many flavors of cakes and cupcakes! We love it as a filling or frosting for so many of our cake recipes, including Classic Chocolate Cake, Marble Cake, Yellow Cake, White Almond Sour Cream Cake, Chocolate Pecan Pie Cake , Peanut Butter & Chocolate Cake Chocolate Chip Cake, Classic Chocolate Cupcakes, and many more. What I’m realizing in making this list of cakes that pair well with chocolate frosting is that I want to put every cake on the list! Haha.. that’s when you know you have a good frosting (or maybe I just like chocolate a little too much). This easy chocolate buttercream comes together in minutes. All that you need is butter, confectioners sugar, cocoa, vanilla, and a little milk! First, add the butter to your mixing bowl and mix for about a minute on medium speed. Add vanilla and blend into the butter. Next, add the cocoa and confectioners sugar. Add most of the milk mix at medium speed for a minute. Reduce to medium speed and mix another two or three minutes, adding the rest of the milk as needed. Like most American buttercreams, this chocolate frosting develops a slight crust. You can reduce the amount of sugar to 5 cups (675 g confectioner’s sugar) for a softer frosting. This Chocolate Frosting recipe should give you a nice medium consistency, making it perfect for piping. Whether you’re making buttercream ruffles, buttercream roses, or piping pretty scrolls or borders, this frosting couldn’t be simpler to work with. You’ll have a bit of wiggle room when it comes to the amount of sugar and liquid. For a thicker frosting, mix in more confectioners sugar. For a softer frosting, add a bit more milk. I also prefer to use whole milk rather than skim or 1% as it gives a richer flavor and a lighter crust when it sets. We have a couple of other delicious chocolate frostings in our recipes section! Our Fluffy Chocolate Buttercream recipe is similar to this classic chocolate buttercream, as it is a crusting recipe which is great for piping. The difference is that it contains shortening, which makes it more heat resistant. It’s always nice to have a heat friendly option for those hot summer days. Just remember that no frosting is 100 percent heat-proof. Shortening based frostings will hang in there for a bit longer though! You can find the recipe here: Fluffy Chocolate Buttercream Frosting. Next, if you are looking for something even more rich, you will also love our Chocolate Ganache Frosting in the Recipes section! If you’ve never tried ganache, it is a decadent mixture of chocolate and cream. Hop on over for the details! 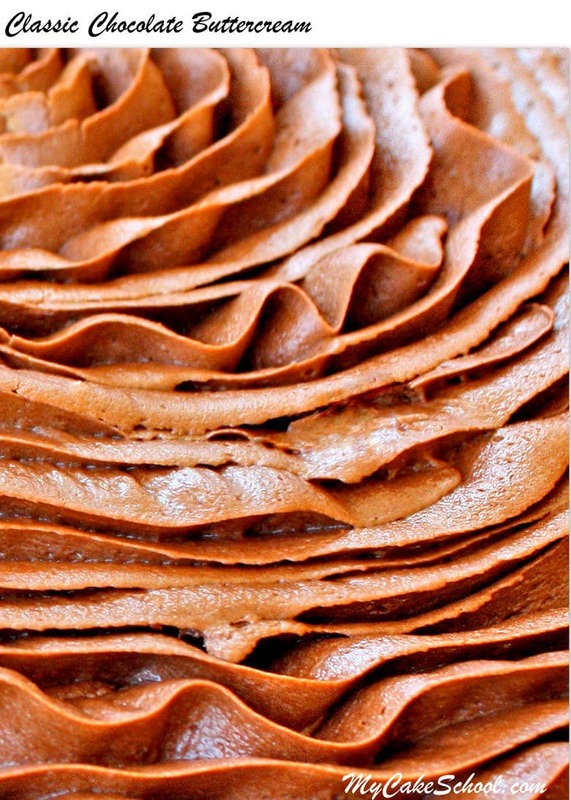 Click Here to Save this Chocolate Buttercream Frosting Recipe to Pinterest! The most delicious and simple Chocolate Buttercream Frosting recipe! Add butter and beat for approximately 1 min. on medium speed. Add vanilla and blend into the butter. Add powdered sugar and cocoa powder. ﻿Add most of the milk. Begin beating at low speed so you won't have a cloud of powdered sugar in your kitchen. Beat at medium speed 1 minute. Reduce speed to low and beat an additional two to three minutes, adding remaining milk as needed. That’s all for now! Don’t you just want to dive into a bowl of chocolate buttercream? Ahhhhh….so good. We think that you’ll love this Classic Chocolate Frosting! Make sure to check out our full collection of favorite tried and true cake and frosting recipes in our Recipes Section! If you are interested in learning more about cake decorating, don’t miss our Free Cake Tutorials section, which also includes a Free Cake Video Tutorial Section. If you are interested in learning even more about cake decorating, we would LOVE to have you as a member of My Cake School! As a member, you will have access to every cake decorating video tutorial that we’ve made over the years (hundreds)! You can find out all of the details here: Learn Cake Decorating Online with My Cake School! Hi Regina, If your buttercream is too stiff, add additional milk 1 teaspoon at a time until it reaches the smoothness you like. Also, when making you could reduce the powdered sugar from 6 cups to 5 for a softer buttercream. If it becomes too soft, add more powdered sugar.